Soak the Chick peas overnight or at least for 3-4 hours. In a pressure cooker, add the chickpeas, tea bag, double the amount of water and pressure cook for 15-20 mins till the chick peas become soft. Don’t over cook it else the chick peas will become mushy. After cooking the chick peas, discard the tea bag. Heat oil in a pan , add the ginger stir fry for a minute and add the chopped onions till they become soft. Add the coriander powder, chilli powder, salt , garam masala and chana masala and fry it for a minute. Add the chopped chillies and tomatoes and fry till the oil starts separating from the masalas. If the masala sticks to the pan, add couple of drops of water. Drain the chick peas ( reserve the water) and add it to the pan. Fry for 3-4 minutes till the chick peas is nicely coated with all the masalas. Then add the water in which the chick peas were cooked and cook for 10 – 12 mins till the gravy become thick. Garnish with coriander/cilantro and serve with Puris, Rotis or Bhaturas. 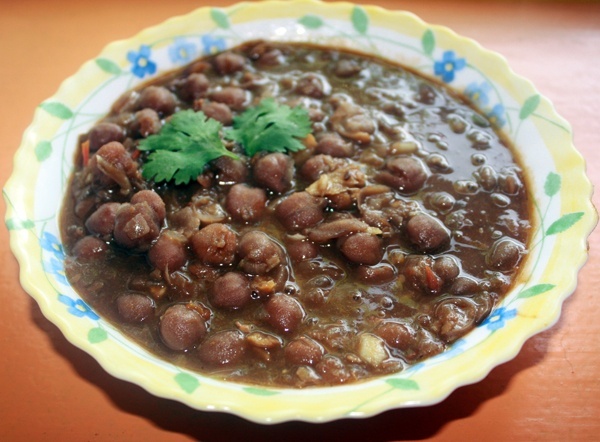 This entry was posted in All Recipes, Pulses & Beans by Kamakshi. Bookmark the permalink.